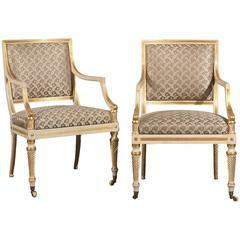 19th century French Louis XV style painted fauteuil chair. 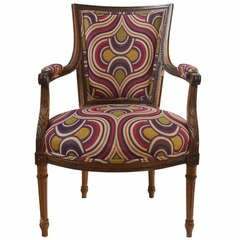 19th century Italian Directoire painted armchair. 19th century French carved armchair Measures: 27" W x 24" D x 39.5" T, Seat height: 19.5" T, arm height: 27.25" T.
19th century French chair, very dramatic in scale measure: seat height 17.5&quot; tall, arm height 26.25 &quot; tall. 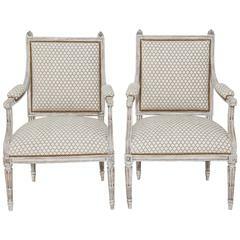 Overall dimensions, 26.5&quot; W x 21.5&quot; D x 44.75&quot; T.
Pair of 19th century Regency style Armchairs. 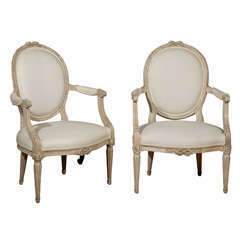 An ornately carved pair of 19th century Louis XV giltwood armchairs newly upholstered in a creamy ecru nubuck Italian leather. 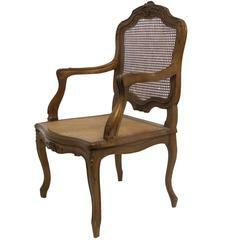 An 18th century Louis XV style armchair, elegantly carved beech wood with caned seat and back. France, early 20th century. Louis XI style fauteuil, restored and upholstered with fabric from 'Prades'.